This psalm appeals to God from those who feel they are being treated poorly and asking for fair judgement over all the earth. There are those considered wicked that seem to be getting away with evil ways. The psalmist wonders how God cannot see. God is creator, He must know all thoughts, deeds and actions of His creatures. The psalmist contends it seems the Lord does not see what is going on, but He still protects His people administering justice. There are questions; who stands up for God’s oppressed against the wicked; who stands against evil doers? The answer is “the Lord.” If the Lord does not help, our soul will end up in unhappy end. When I fall the Lord holds me up. 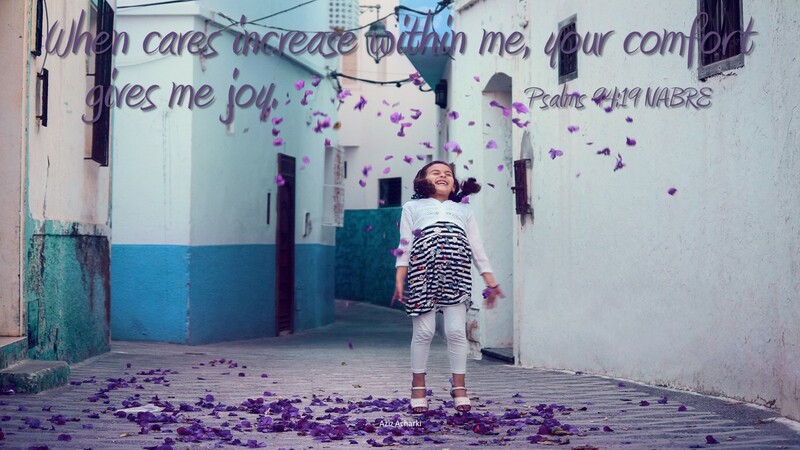 When I care and am concerned about many things, it is the comfort of the Lord that brings me joy. God cannot be unjust, so though we may not see action we can trust justice will be done in time. The Lord is our strength and we should not fear. Fairness seems to be a common complaint when we think others have more for less. The first words out of our mouths when we are children, is “that is not fair.” We see in the psalm an appeal for fairness yet we know that God is always taking care of us. If we have concerns or cares we bring them to God and God takes care. If we are hurting, or fallen, or need anything we go to God and we are helped. We have no need to worry about others, and how they are treated, God is just and will do what is right. If we live comparing ourselves to others, we cannot live joyfully. Comparing is a human trait not God’s. If we compare we will see what is unfair, which will lead to our despair. But if we have a care, it will be God who we trust to repair our joyful air. Do you compare your life to others? If so has it brought you joy?